Come this time of year, most folks look outside and see the white stuff and think “It’s snowing, my canning is all done!” And they jump with joy. Then, there dyed in the wool food putter-uppers, who think that winter is just another opportunity for doing different stuff. I’m one of the latter. Winter is the 4th season of food preservation. So, what DO you put up in the winter? My answer to this is, well, there’s a lot of stuff to work on! Remember in August when you just couldn’t bring yourself to turn the pressure canner on and add *more* heat to the kitchen? 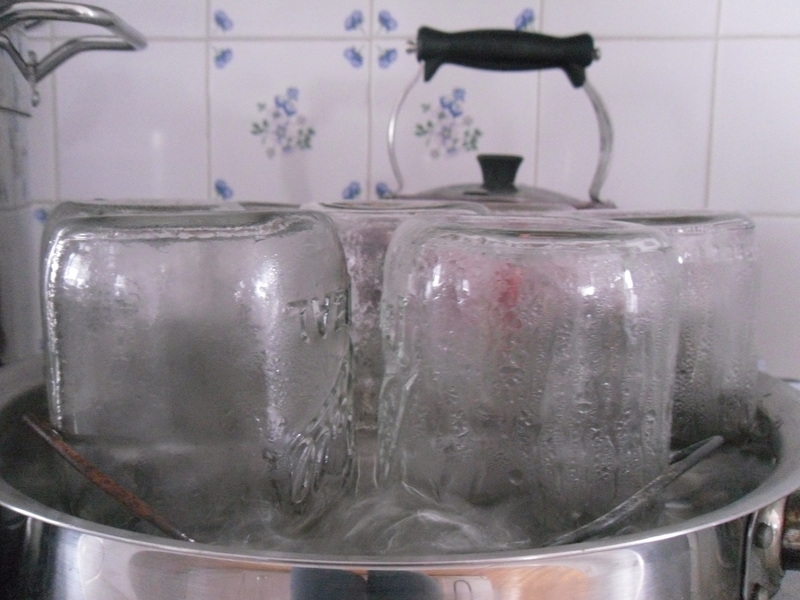 Now that the temperature is down in the teens, this is the perfect time to do that batch of pressure canning. I spend my weekends during the winter over a nice warm stove. It helps to keep the house (and me!) warm. What do you can in the winter? I can lots of things. Winter is the perfect opportunity to refill your stock of canned beans from all those you either purchased dry or let dry on the vine in the summer. I can lemonade and lemon cleaner during the winter. In some other, much, much warmer place than I live, it’s citrus season. They’re cheap in January. In the winter, we put on our mittens and go through our freezer, looking for freezer burnt stuff and things which have gotten buried. It’s great if you just want to clean house and not defrost – nothing that you bring out will melt. These things are also frequently canned – canning freezer burnt meat takes the freezer burnt out of it. I’ve a whole shelf of canned sausage from last year’s freezer adventure. Extra dinners. Making chili? Double batch it and can the left-overs. Same goes for any other meaty sauce or soup. Winter is also great for dehydrating. This too can help to heat, not overheat, your house. Winter is when we have great grocery store sales on things like celery, carrots and mushrooms. All of these get run thru the slicer on my food processor and dehydrated. I then put them into my bailing wire jars and store them – this is the perfect use for those older jars that you may not be sure of the seal on. Check on the apple cider vinegar that you put up to ferment in August and use. 4 Comments on "Putting Up Food in the Winter"
As far as what to can in the winter, that is when I can turkey, particularly turkey breast in 1/2 pint wide mouth bottles. Stores run turkey specials as loss leaders. By making stock up purchases at that time, you can end up with a 24-30 lb. bird for a greatly reduced price or free if ancillary purchase amounts are large enough. The breasts of a bird that size yielded a dozen jars. The rest of the bird can be de-boned and canned as is or ground canned with spices as sausage or plain. My preference is to cook in my 21-qt pressure cooker, drain the spiced broth from the carcass and skim off the fat. The broth is then added to the jars of breast and dark meats. What is not consumed in that step is used for soup base. Experiments with soups using spiced broths has been quite successful if the amount of dry ingredients as rice, wild rice, beans of various types, split peas, pearl barley. To this, diced fresh vegetables can also be added along with 1/4 tsp of granulated garlic & 1/2 tsp of dried onions in each quart jar is about right. It is important not to use more than 4 oz. of bean-grain mixture. Add the liquid and shake well to disperse the dry ingredients, especially if you use white rice. This helps prevent a gelatinous mass at the bottom. Shake again as the jars are removed. Bringing the cooker up to 15# and dropping requires about the same amount of time as the holding canning time for the recommended cooking time @ 10#. Winter canning is a good time to experiment with your own recipes and see what your family likes. It was also a good way to salvage the remnants of our refrigerator/freezer when the power went out for over a week. Cooking chili in a pressure canner yields about 17-18 quarts with each batch. Add the browned meat, peppers & onions after the beans are pressure cooked. Stir well and fill jars. Because the beans have been pressure cooked to 15#, jars processing time may be reduced with little risk. I’d like to ask a question please. Does anyone know of a specific propane stove that is safe to pressure can on? I have a glass top range and can’t can on it. It is recommended not to use propane stoves that put out over 12,000 btu’s ( most seem to be over this output)which supposedly can damage a canner. So I’m having a hard time finding one that is large and sturdy enough to hold a 23 qt Presto canner at about 12,000 btu’s. Thank you! There are several ways to get around this. I have the same canner. One is to keep the flame turned down on the propane stove. If the stove is rated for 15,000 BTUs (this rating comes from the stove turned up on HIGH) then you can take a guess at what you would have to reduce the temperature to in order to stay under 12,000 BTUs. Yes, it may take longer for the canner to come up to temperature but if you protect your canner then it’s worth it. The Coleman Matchlight 2-Burner Propane Stove – would work for your purpose. Each burner puts out 10,000 BTUs (well within the safety range for the Presto) you would fold this stove out completely flat, so the canner fits on it. And while it looks flimsy it is actually fairly sturdy. I may think twice about double decking jars and loading the canner up with meat – but I would have no concerns about a normal canner load. If you are trying to can on a camp stove like this, invest in a 20 lb tank adapter – so you can use a larger propane tank. The little 1 lb tanks will run out or freeze up on you in the middle of processing a load. The other thing you can do with a larger more robust propane stove (like a big Cast Iron Camp Chef stove) is to use a deflector (or diffuser) plate, so the flame is not coming in direct contact with the canner. Any good chunk of metal will do – OR a cast iron griddle if you have one of those (don’t worry about melting cast iron it doesn’t even get soft until you exceed 2100 degrees and you aren’t going to hit that while canning). Camp Chef sells many accessories for their stoves one of those is a griddle. If you already own the griddle, you are good to go – try canning a load on the griddle! I’m rather fond of the single big burner type stove, such as this: http://www.directcampingstoves.com/product/SQ14 The wider legs allow for easy use and are sturdy enough to put a pressure canner on.